"Last time he rocked the boat. This time the sky's the limit." In the 1992 blockbuster Under Siege, martial artist turned Hollywood hero Steven Seagal expanded his acting repertoire from urban cop to Navy SEAL. 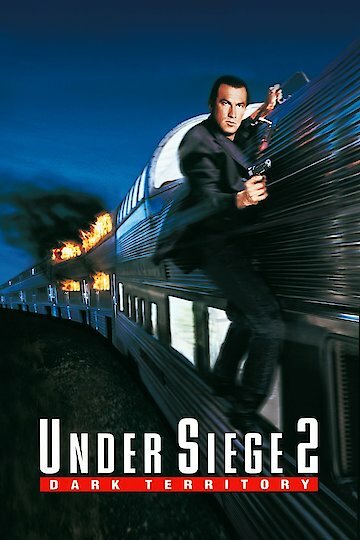 Seagal's character, Casey Ryback, hops a train with his niece for a vacation. Unfortunately, the vacation does not go as planned when high-tech terrorists hijack the train in order to have a moving platform from which to enact their nefarious plot. Using similar tactics to his previous heroics on a Navy ship, ex-SEAL Ryback escapes the terrorists' initial assault and works behind the scenes to foil their plans, hoping to save his niece and the rest of the passengers. With the moving train making it difficult for authorities in Washington to track the terrorists, Ryback must work alone to thwart a heinous plot that could result in the death of millions. Under Siege 2: Dark Territory is currently available to watch and stream, buy on demand at Amazon, Vudu, Google Play, iTunes, YouTube VOD online.